Mezzi paccheri are a marvelously thick and meaty pasta shape! They have a wide tube shape, shorter than normal paccheri, and are great baked and with chunky sauces. Try them in a rustic dish with smoked provola, fried eggplant, crumbled sausage and cherry tomatoes; they’re also delicious paired with seafood, or a simple tomato sauce. Pasta Faella is crafted according to tradition in the legendary birthplace of Italian dried pasta, Gragnano. This pasta is real Italian pasta at its best. When cooked, this pasta fills the room with the intense aroma of freshly baked bread and toasted grain. Its slightly rough, porous texture creates an ideal surface for collecting sauces, and its consistency is firm and chewy - just be sure to cook it al dente to fully savor its flavor and texture! The hard durum semola flour used to make Mezzi paccheri Faella is 100% Italian semola di grano duro. Crafted in Gragnano, this is real Italian pasta at its best. When cooked, this pasta fills the room with the intense aroma of freshly baked bread and toasted grain. Its slightly rough, porous texture is ideal for collecting sauces, and its consistency is firm and chewy - just be sure to cook it al dente! Pasta Faella is made from nothing but the highest quality semola and pristine spring waters from the Lattari Mountains. 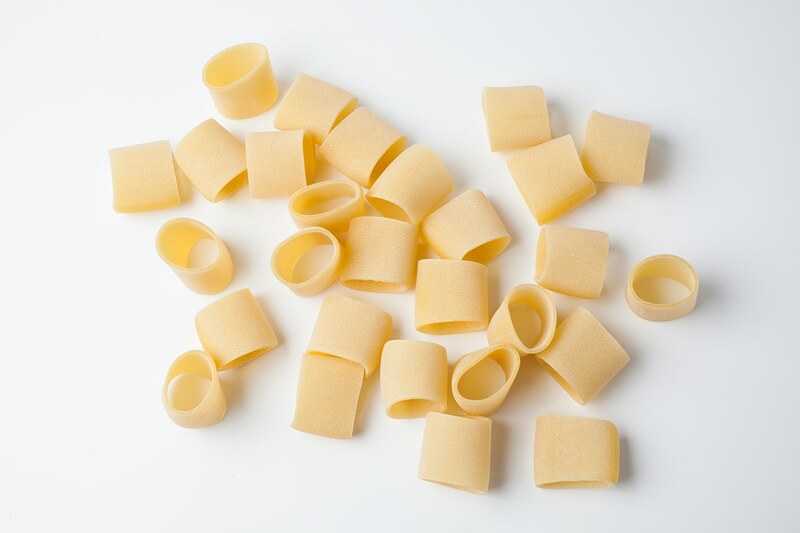 The pasta is extruded through traditional bronze dies created specifically for each shape, and is air dried naturally for at least two days - unlike industrial pasta that is dried in less than an hour at high temperatures in electric ovens. Pasta Faella, instead, is a classic artisanal pasta that is easily digested and gives a great sense of satiety. Pasta from Gragnano, Citta' della Pasta!